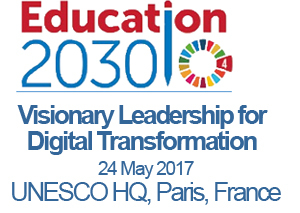 Mobilizing worldwide education and university stakeholders to make them launch concrete actions aimed at a digital transformation of higher education: this is the objective of the “Visionary Leadership Forum for Digital Transformation”– in which UNINETTUNO took part, being represented by Dr. Nicola Paravati, Head of International Relations – that was held on May the 24th at UNESCO headquarters in Paris, and co-organized with the ICDE and D-Transform. UNINETTUNO is the only Italian university invited to the event and, in the presence of an international audience, it will illustrate its “University for Refugees – Education without Boundaries” Project in which technology, university and innovation are joined to allow refugees and immigrants to have their qualifications being recognized and complete their studies. The Forum’s background issue is “Sustainable Development Goal 4 - Education 2030: Ensure inclusive and equitable quality education and promote lifelong learning opportunities for all”. In fact, the event that took place in Paris represents an important occasion for dialogue and exchange in view of launching concrete actions aimed at overcoming the Digital Divide; increasing investments in the digital sector and creating an educational model which, thanks to the innovative methodologies and technologies offered by virtual reality, by artificial intelligence, by customized learning and digital assessments, may concretely transform higher education.